Joseph Lawton, AIA, CCM, FCMAA, DBIA, CM national practice leader, program management consultant, and senior vice president for HNTB Corporation, earned a certified Design-Build Professional designation from the Design-Build Institute of America. It is the design-build industry’s highest professional designation. 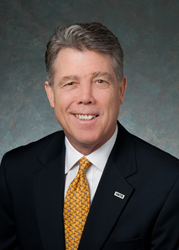 Lawton is based in HNTB’s Arlington, Virginia, office and joined the firm in 2012. Lawton is a recognized specialist in construction with more than 40 years of extensive experience in design and construction activities, having overseen complex programs in excess of $5 billion nationally and internationally. Currently, Lawton and team are overseeing the massive Port Authority of New York and New Jersey Bus Terminal Replacement program and the New York State Thruway Authority Tappan Zee Bridge replacement. According to the association, DBIA certification is the nation’s only measurable standard of an individual’s knowledge of the Design-Build Done Right principles vital to successful project delivery. By completing these requirements, which touch on all aspects of design-build, candidates earn the right to display “DBIA” after their names, identifying them to design-build end-users and the industry at large as experienced design-build professionals.